Happy Monday! I've got a new tutorial and a great giveaway for you all. Graftobian has a super cute new airbrush design and i'm giving away a complete Graftobian Walk-Around airbrush system! This is the exact system I use in my kit and it is pro level quality. Check it out! I began the tutorial by priming with Graftobian's HD Antishine primer using my Sedona Lace Vortex Flat Buffer Brush. 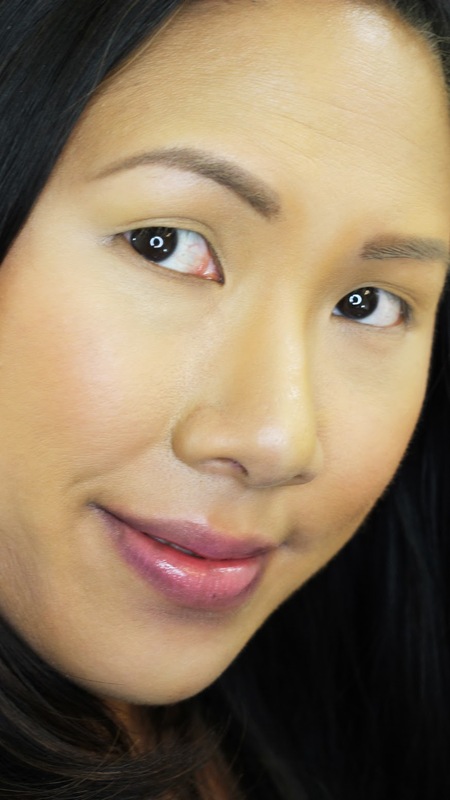 Then I applied corrector from Graftobian's 5 pan corrector palette - peach for undereye circles, green for redness around my nose, and yellow to highlight. Next I used the Graftobian Warm 5 pan palette which is part of the airbrush system. I used Desert Sand #2 from the left) to conceal blemishes with my Sedona Lace Vortex Synthetic Blender, then I contoured with Golden Sunset (#3 from the left). I airbrushed the coordinating foundation on top of the cream. I fished off by setting my foundation with Graftobian's HD LuxeCashmere setting powder in French Silk with my Sedona Lace Luxe Essentials Face Brush. From there, I applied the HD Pro Powders to add more highlight and contour and used a peach blush from the Graftobian Warm Blush Palette. I finished with a few spritzes of Graftobian Makeup Setting Spray. The set is regularly $300 but will be on sale for $275 at IMATS LA. I'll be there this weekend at the Alcone Booth. Come and say hi! The kit includes the airbrush compressor, gun, hose, international outlets, power cord, battery charger cord, HD Makeup 101 DVD, and the Warm, Cool, and Neutral Sampler packs - a total of 15 cream foundations and 15 glamaire airbrush foundations. What a deal! I carry this exact system in my pro kit. I'm giving a lucky reader the entire system! Good luck! Let me know if you'll be coming to IMATS, hope to see you there! FTC Disclosure: Giveaway sponsored by Graftobian. I would love to win this airbrush system. I would be a perfect compliment to my makeup kit. HEY RENREN! OMG! I WOULD SO LOVE TO WIN AND BE SOOO HONORED, GRATFFUL AND VERY APPRECIATIVE SO TO WIN THIS! I WOULD LOVE TO WIN BECAUSE I HAVE HEARD SO MANY AMAZING REVIEWS ON THIS FABULOUS GRAFTOBIAN AIRBRUSH SYSTEM, AND WOULD SO LOVE TO TRY IT MYSELF! I NEVER TRIED ANY GRAFTOBIAN(HIGH END) PRODUCTS! I WOULD MAINLY LOVE TO WIN BECAUSE I AM NEW CERTIFIED MUA AND I AM SURE YOU KNOW HOW IT IS STARTING OFF! BUSINESS VERY SLOW AND I AM TRYING TO BUILD MY KIT/PRODUCTS AND MORE SO BUSINESS/CLIENTELE! I HAVE RECENTLY BEEN ASKED TO DO A FEW WEDDING PARTIES IN WHICH TWO OF THEM REQUESTED AIRBRUSHING IN WHICH I KNEW HOW TO DO BUT I DONT OWN ONE AT ALL, SO I HAD TO TURN IT DOWN, WHICH I WAS SO UPSET! I WOULD BE A BLESSING AND REALLY HELP ME OUT TO OWN THIS SYSTEM FOR MY CLIENTS ESPECIALLY WEDDINGS TO DO THAT CELEBRITY..FLAWLESS FACE..PERFECT PICS AND JUST MAKE THEM FEEL AND LOOK SO AMAZING ON THE BEST DAY OF THIER LIFE! I KNOW THIS WOULD REALLY BRING ME BUSINESS AND ALSO I CAN USE IT FOR MYSELF AND EXPERT MY SKILLS WITH IT! NOT TO MENTION IT IS JUST SO CUTE MY FAVE PRINT ;) AND I CAN USE IT TO TRAVEL WITH ME, JUST PERFECT! THANK YOU SO MUCH FOR THIS GIVEAWAY AND GOD BLESS!!! I would love to win this because I am building my kit up & would love to learn how to airbrush. I would love to win this airbrush kit to expand my makeup knowledge, and to start learning about airbrush finishes. i would REALLY love to win this. i live in HAWAII so we are not blessed to have these Graftobian products anywhere near here. Boooo!! so i dont own any and i know i can order it online but shipping and waiting for it to come is Unbearable hehehe.. i would love to win this. I love makeup and always trying out new products.. airbrush makeup is what i also would love to give a try. i would be the happiest girl alive to have that very honor to have this added to my life. ALOHA from Oahu, Hawaii. God bless and Xxo!!!!!!!! Hi! First I wanted to thank you for responding to an email I sent you some time ago regarding Graftobian. Because of your recommendation, I use their foundation in my kit and love it! I have been wanting to learn airbrush for a long time and I know that having this kit will allow me to increase my knowledge as an artist and finally offer it as a service to my clients! I would love to win to try to conceal my scars in pictures. I would love to win this airbrush kit because I'm wanting to add better products to my collection that I am not able to afford. i would like to win this airbrush system because i love the look of airbrush makeup. Hi! I would love to win because as all makeup artists know building your kit with quality items is expensive. I have already purchased the graftobian glamour creme palettes in cool and warm because of you Ren!! Your so not good on my wallet lol. I would love to win this airbrush system, because i have never tried airbrush makeup before and i would really like to learn how to use it. I would love to win because I would love a more professional look! I would love to win, because i really want to learn how to use it. I would love to win this in order to increase my knowledge and skillset as an aspiring MUA. I am determined to master every aspect of makeup artistry that I can find to learn. From glamour and editorial to FX and airbrush to everyday freshface makeup. This airbrush system will be but one more step that gets me closer to fulfilling my dreams. Thank you very much for this giveaway! I would like to win because it would give me a chance to branch out and use different techniques to apply my makeup. Also, since I live in Florida a light layer of makeup is always good in this heat! I need this system in my life! I have very dry skin and I have tried so many foundations that my make-up room looks like a department store make-up counter and I still haven't found something that works for me. I would really love to win this system because I've been wanting it for a while!! i would LOVEEEE this for my clientele!!! I have been lusting over the Graftobian airbrush system since you first introduced it. I would love to win but if I don't, I will definitely be buying one myself. Hi Ren! first off thank you so much for doing this giving, it's so thoughtful. and thank you for being great with your videos, so informative and you have great lighting so it's easy to see the quality of the products you use. I would love to win- as I am looking to replace my larger system with a walkaround, battery operated one for my kit- BUT one that is still powerful enough for all my needs! So was Excited to see your review about this Graftoban one, especially since I already have their aribrush & cream makeup in my kit. I would love to win this amazing Graftobian airbrush system and all that's included in this giveaway because first off I cannot afford it, second, I would like to build my kit with something of quality, that I don't have to worry about it breaking in front of my client and third, this would increase the number of clientele I have. Makeup has been, is and will always be my passion. Unfortunately, I won't be able to go to IMATS Los Angeles. Thank you for this amazing giveaway and THANKYOU GRAFTOBIAN. I would love to win this so that I can airbrush makeup and would love to have Graftobian products. Such an awesome giveaway and hope I win. I would really love to win this since i have never tried airbrush make up before and we don't have it here in Malta (Graftobian) brand! Hola Ren!! This is actually my first time ever commenting on any blog so I hope I'm doing it right! First off, I would like you to know that I just think you and your make up talents are AMAZING!! I myself am a beauty addict, that was mainly into regular everyday makeup until I seen your work on your Halloween tutorials...GOD BLESS! those videos completely changed my view on makeup in general, I never stopped to think how much could actually be done! Since then, I've practiced and practiced on FX makeup and I'm getting pretty good at it, which is why I've decided to be a freelance makeup artist! So thank you so much! For the tutorials to better me and help better my talent, for the inspiration to go on with my dream of making makeup my life (because I know your self taught). Which is why It would be so awesome to win this airbrush kit! So I can learn to get down with it! Lol..thanks from all of your subbies for giving us this opportunity!! I would love to win this as new makeup artist this is a missing essential to my kit please help and pick me. Thank you, You are my inspiration. I would LOVE, LOVE, LOVE, to receive this airbrush system. I am a freelance makeup artist and I was researching airbrush kits. This would be perfect. It would save so much time when working with clients. All of my clients request airbrush but unfortunately I do not have one. It is not in my budget. Thank you for doing this. It's the last thing I need for my kit. Plus it'd be fun to treat my mom to a makeover before my mom leaves on her big vacation after she retires this year. Hi Ren!! First off I want to say thank you so much for having this giveaway. I've been wanting to out an airbrush system for so long now cause I love what people have been saying about them. I would really love to win because I just can't afford it right now and I've been wanting to try it out for so long. Thank you so much for giving us this chance to win this airbrush system!! First time commenting to you but I just want to say, like to many, you are a huge inspiration to me and I've followed you for a while. Again like many I'm a newbie freelance make-up artist who would be beyond blessed and grateful if I could be picked to win this airbrush system if not then thank you anyway for the giveaway !! This is absolutely amazing, great video! I'm a huge fan of Graftobian and would love to own this! What a great giveaway! Always love your videos! I would like to win so I can finally be able to add airbrushing to my pro-kit! Wow, stunning, your skin looks amazing! So pretty. I would love to win this airbrush system because I have been wanting to try airbrushing for a long time now. However, the opportunity has not come to me yet because the price and limited reviews of airbrush system. Now,I get a chance from you. I would be so grateful to learn more about the system and how to use it. Nice blog! Thank you for awesome giveaway! Would love to win.I heard only good things about airbrush system.Its free of many stuff and best for your skin.Last all day.Really really want to try it. I have tried and love the Graftobian creme (we are the same color) so this video is perfect! I would definitely love to win since I've been wanting to try the airbrush system but it's a little expensive and it's not something I can afford right now. I would love to win this, I've always wanted to try airbrush makeup! Wow this is an amazing giveaway! I would love to win this because I have been doing airbrush makeup for 3 years a now with the worst cheapest machines and gun ever...I'm not going to lie...they have never done me wrong and my airbrushing is OK but I want to be better and I think this will make me look more professional instead of walking in with a compressor that's clearly from eBay (not that there is anything wrong with eBay). I have been following you forever and highly respect your work not to mention I had the pleasure of meeting you at the Graftobian counter at the makeup show in NYC in 2013....I have purchased everything you have ever promoted and you started my love for this company...I have purchased from them ever since...I hope you choose me and if you don't whoever wins is one lucky person! Oh my goodness, you make it look so easy! I would love to win, so maybe my makeup would finally look flawless also! I would LOVE to win this system!! I started using Graftobian cream foundations because of your early videos. I love it! This airbrush system would only take things up a notch. I've purchased an OCC airbrush system and I'm not in love with it. I have issues with the travel system. I would love a new compressor and the opportunity to get so much makeup. IMATS LA is officially sold out, so winning would be AMAZING!! Thank you so much, fingers crossed that I win! I would love a chance to take my makeup to the next level. I've played around with some airbrushing before. Being a college student, it's something I can't afford on my own quite yet. So winning this system would mean a great deal. Thanks! Hi ren! i would love to win this because I can't afford a lot of makeup. College student problems lol. This would be so awesome to try! I want this system the leopard print is me all day. But the pink is also cute. I have a commercial unit that takes forever, I really want to try Graftobin. I want to win. I'd love to win this airbrush system giveaway because as a student and freelance makeup artist, it's hard to afford such an amazing system. I have tried Graftobian products and love the brand but winning the airbrush system would MAKE my kit and I would love it!! Well Ren Ive won 3 things in my life (3 children) and Im starting to get that feeling again so if I don't win this I will be forced to have another baby. About. Millions of people but I want to make my children proud of me and I want to teach them that hard work and dedication really pay off. So even though everyone wants to add the system to their kits, and I will too, my purpose for entering this contest reaches a little further than just to make people look beautiful. I know it's a one in a million shot bc I've read responses on here and they're all deserving so I know you have your work cut out for you on this!! Good luck to you and all your endeavors and I hope that someday I can inspire people the way you do!! Hi Ren !!!! I'd love to win this airbrush system because I've never had chance to work with it because of the price!!! I would learn a lot from expanding my makeup knowledge to this type of application!!! I taught myself how to apply makeup and do it for family and friends and would love to try it on them!!! I also recently started a youtube channel for makeup to show family, friends, and others how I personally apply makeup. I've been subscribed to your channel for forever and love it!!!!! Your an inspiration!!!! what an AWESOME GIVEAWAY! i would like to win this airbrush system because it's the complete package to help me build my kit. i am an aspiring makeup artist not yet established. It is extremely costly building a kit with quality products. I want to provide my clients with the best products and service, this system would ADD VALUE to my kit and my clients overall experience.I have spent a couple of thousand dollars on my kit so far without any PRO discounts. I travel to attend makeup seminars to invest in myself. To win this airbrush system would be like a treat for me and a confident booster! i have never won any giveaways so i would be soososososo grateful! I need this for a flawless base. I would love to try cause this is something new to me. I'd love to try out airbrushing! Hey love! I've been following you on youtube since the dawn of time! I REALLY HOPE TO WIN this awesome giveaway because I BELIEVE in the quality of Graftobian products! Thanks to you, it has been a staple item in my makeup kit. I have followed your recommendations on getting the HD Foundation Creme Pallette and also the HD powder foundation set. My clients absolutely LOVEEEE the finish of their faces and I owe it all to you for opening my eyes to this AMAZING brand! I really want to step up my game in creating a flawless finish for my clients therefore I am sure this airbrush makeup by Graftobian would be a winner!! Please pick me :)) I follow you all the way from Malaysia! Aloha RenRen... I want to thank you very much for all the great advice and hard work you do in keeping all of us informed about the beauty world... I would love to be blessed with the graftobian airbrush unit... Who wouldn't right??? I love the results that an airbrush system can give... absolutely flawless... I have experimented with another system and loved the results but sadly I can't afford to purchase one... I am a single mother of three and on a tight budget... Anyway keep on doing a good job with what you do best !!! Mahalo for reading this comment. Thank you very much for this Great Giveaway. I would love to win, because I've been doing more bridal makeup and would love to be able to start using an airbrush system, but cant afford to purchase one at this time. This would be great for me to expand a little bit! because it would make applying makeup so much faster and easier. Thank you for the opportunity!! Hi Ren! Thank you for always providing professional tutorials for all of us to learn from. I am excited to begin airbrushing. I recently began freelancing but I have yet to incorporate airbrushing into my makeup application routine. I am a lover of pretty much anything Graftobian. 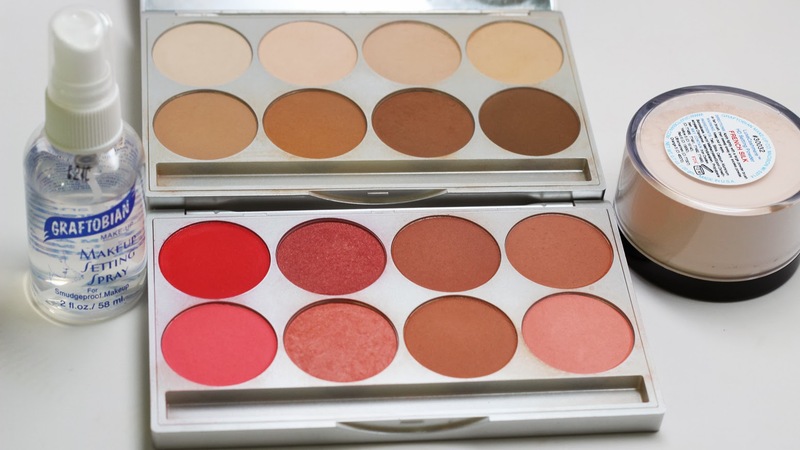 I have taken your advice in the past and purchased super palettes of foundation. Amazing! I would love to be considered for this giveaway and would be very grateful to win. Thanks! You are awesome. 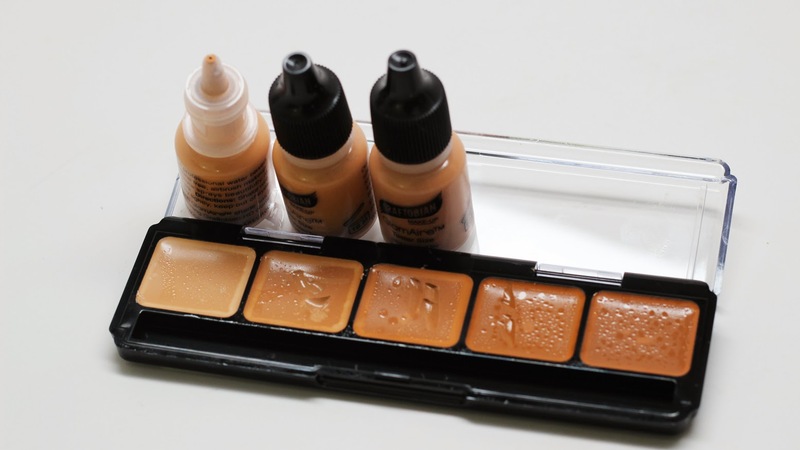 As a newbie MUA, this would be very necessary and helpful for me to apply base flawlessly and with ease. I couldn't afford it at the moment.Rest assured I will surely take care of it :) Thanks! P.S. Please come back to Charlotte NC for another meet up! I'd love to win this, because I can't afford it otherwise. I'm freelancing and have the Graftobian HD foundation palette which I love. Always looks amazing in photos and can't imagine the airbrush finish. I'm trying to start working with bridal as well and airbrush is huge in bridal makeup. O.M.Giveaway..I WOULD LOVE TO WIN Because As A Student You Don't Really Have The Cash To Go Out And Buy Frivolous Things.I LOVE To Get Ready And Mix & Match Fun Colors For Class, Parties, Dates, And Everyday Looks That I Get From Uu. I've Never Tried An Airbrush Which Would Probably Improve The Makeup I Do, Since I Also Do My Friends And Family's Makeup ALL THE TIME Which I ENJOY And Hope To Make A Career Of One Day Keep Up The Great Vids Ren! I would love to win because I have always wanted to try airbrush makeup. I' suffer from hyper pigmentation and large pores. I think that using an airbrush system would do my face wonders!!! I would love to win this so I can start my new career after I retire. It's anew and good way to stay busy and active and meet new people and do something you love and help others. I would love to win this system because it would be the perfect partner to the graftobian foundations I already use in my kit making it super easy to find the right colors! I would love to win this airbrush system because I feel it will finally be my answer to cover and hide my melasma spots. I have had melasma for almost 10 years now and it's very embarrassing. Drug store makeup cannot cover the spots nor can drug store topical creams fade them. I cannot afford the high cost of laser treatments or chemical peels so I need to find a way to cover the melasma but still have a natural finish to the skin. I feel an airbrush system would work at doing so because of its fine mist that is buildable. Drug store and higher end makeup do not offer the coverage I need without becoming awfully caky. Thank you for this giveaway and I wish everyone good luck. I would love an airbrush kit because I've always wanted one but never could afford one. I would like to win this airbrush kit because it would help me reach my goal of becoming an airbrush makeup artist. After attending a makeup workshop with Synthe in Atlanta, Ga I was hooked. Although Synthe is an accomplished and experienced airbrush artist (which accounts for her skill level) she made it look so effortless. Furthermore, she explained that MUAs should not limit themselves to using just brushes (while brushes are great to apply makeup). I'm beginning to define myself as a MUA and am wanting to expand my versatility. Currently, I cannot afford Synthe's class (even at the discounted rate) and would really like the opportunity to acquire this skill. Thank you for your generous it and offering your followers the opportunities they otherwise couldn't afford. Enjoy IMATS! Thank you for being an inspiration to us all! I have followed you since the beginning of my MUA journey 6 years ago. I am a freelancer who relies on the wealth of knowledge that pro's like you provide via platforms like YouTube and Blogger. This kit would be used A LOT and I have never been able to try Graftobian products - but I know it's worth it. I recently started working in photography and LOVE the airbrush application (so does the photog - less editing). Thank you again for such an awesome giveaway! First I would like to thank you for doing this wonderful giveaway, its great seeing a fellow YT guru and makeup artist give back to others. It shows how much they actually love and care for their work and supporters, So thank you. I would love to win this airbrush system because as a makeup artist I would like to expand my knowledge and kit with other things and with this system it will give me a new range of skills and services to offer clients. This way they have the option of chosen airbrush or the regular application. This system will also help me out with the amount i set aside to spend monthly/yealyr on products for my kit. As you know building/adding on to a kit is not easy or cheap and this would help me out alot. Thanks once again for this giveaway. First off, you are the business! Youtube fan for life! Love your brushes! Thanks for always finding the time to teach us. Pick me, pick me, pick me! I have an airbrush fund, being saving little by little. This is that one gift this girl wishes she had. Its a style diva must have and a essential for any girl professional or not. If you love makeup as much as I do, its a must, period. Wishing you continued success! I would love to win this to add to my beginner mua kit. I love that it has a battery pack! Airbrush and special effects makeup has been two of the top makeup topics I've been interested in! Hey RenRen, First off I love you and all that you do. I would love to win this airbrush system because so many of the makeup artists I respect rave about it. If I won this it would be my first time using this beloved product, first airbrush system ever, and first time winning a giveaway. Keep the eduction,product knowledge and tutorials coming. I'd like to win this as I am looking to upgrade my current air brush system. I would like to win, because we do not have stuff like that in Poland(I think so, maybe we have, but I did not see). Moreover my face look terrible after treatment with acids. So I'm still looking for something to cover my redness and small surprises. Graftobian system could be incredibly helpful. It seems to me that with his help I would stop looking for ideal foundation. On tutarial, you showed amazing technique and I hope to try it too on my face! Nice blog Ren! I would like to win the graftobian walk around set to have a backup to the one I already have. I'd like one for FX formulas and one for the waterbased formula.Graftobian is a great company! First of all I'd like to thank you for the opportunity to win this amazing giveaway Ren. I would like to win this giveaway honestly because I need to start this year on a happy note. Last year I spent most of the year in & out of the hospital. I had a mastectomy & a reconstruction. I suffered a few complications & now I have a huge scar on my chest. As a woman having your breast removed is traumatizing and it doesn't do much for your self esteem. I'd like to win because I'd love to be able to learn how to use an airbrush system & use it to hide my very visible scar. It would truly mean the world to me to win. Thank you again. Good luck to all the ladies entering & God bless. Would love to try airbrush makeup. It's still so expensive but indeed produces beautiful polished looks. :) Thanks ren for the chance! Hi, I would love to win because I would love a more professional look. I would like to win because I want to learn how to do air brush makeup especially for bridal makeup. Hey Ren Ren. I would really love to win this. Please pick me. This would the best ever wedding gift for me. I'm not a professional, nor MUA, but I have a passion for make up. I recently discovered your youtube videos from 2+ years ago and share that same passion as you! I have spent years and $$$ trying to find my HD foundation.. from drug store buys to department store brands, and just can't seem to find it. I believe this is my answer to help my heart.. and my face "heal", lol! While I have very little knowledge with using a machine like this, I know your thorough videos will walk me through it. And the more I am able to follow you and practice, the more I am sure to love this product :) :) As always, thank you for thinking of your followers and for the greatest giveaways!! I would love to win this system because I would like to be able to include it in my kid and learn more & how to do it better. Omg I've been eyeing out this system every since I watched your first YouTube video on it (back when YouTube wasnt in hd, lol)!!! I've had it in my shopping cart a countless number of times, but being a college student, I just couldn't spend that much money at once. This fall I'll be doing my future sister in law's makeup for her wedding along with all her bridesmaids makeup and this would be perfect to have!! Please keep making videos, you're such an inspiration!! Love you! Hi Ren Ren. Please pick me. I've been commenting almost everyday. Also I would really appreciate if you could do some dramatic bridal looks using a wine red colour. Hi Ren Ren, thank you for this awesome opportunity. I would love to win this system because it is so compact and would be much easier to pack in my makeup kit. 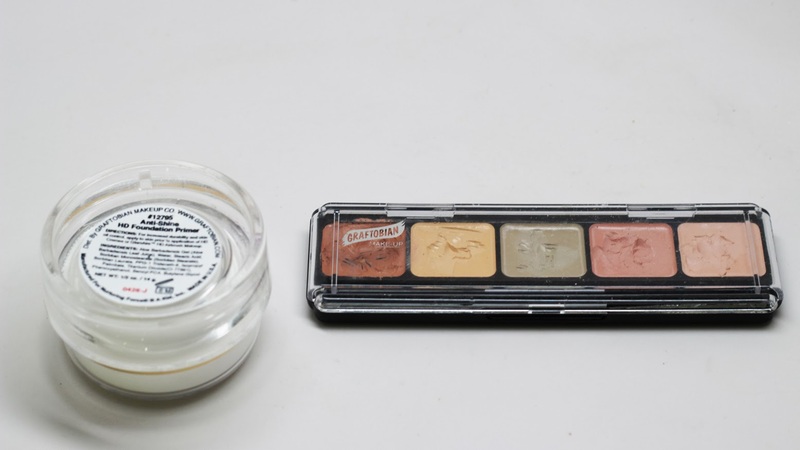 I have been using the graftobian cream pallets in my kit per your recommendation, and I absolutely love them. This airbrush kit would definitely complete my kit. This would be such a great addition to my kit. Been wanting to add airbrush to my kit, just have not been able to. if i win. love to use this very good animal print airbrush kit.